We decided on a charity called Magical Meadows, a horse therapy center in Indiana that works with differently abled individuals and veterans. I initially worked to understand why they do what they do, and why they are special. After pre-interviews with the volunteers of Magical Meadows, I was especially interested to learn how empathetic the horses are to the emotional needs of those they are working with, and how their own movements train our own bodies as riders to be stronger and move more efficiently. It was important for us to show the empathy of the horses and their connection with their humans. 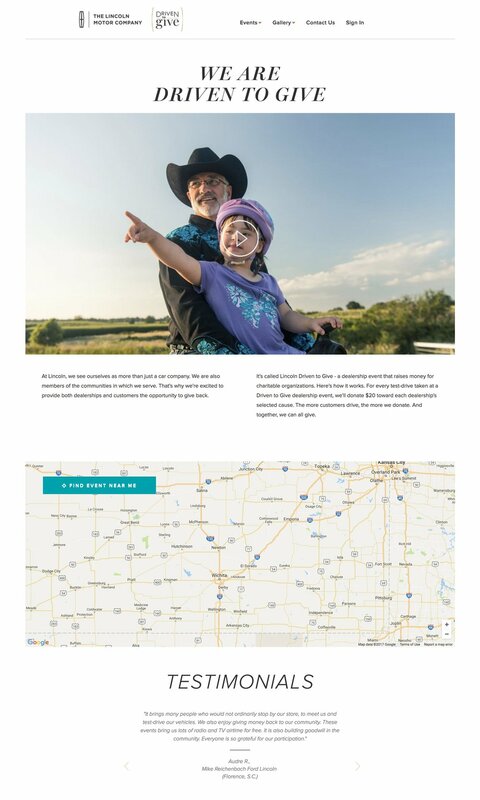 I enlisted the help of filmmaker Kat Keene Hogue, whose approach fit the bill for what I was looking for (warm, human, approachable but elevated), and we headed to Indiana to produce this film. Morgan Phillips shot the photography, and my team in the Brand Publishing Lab worked on the article. 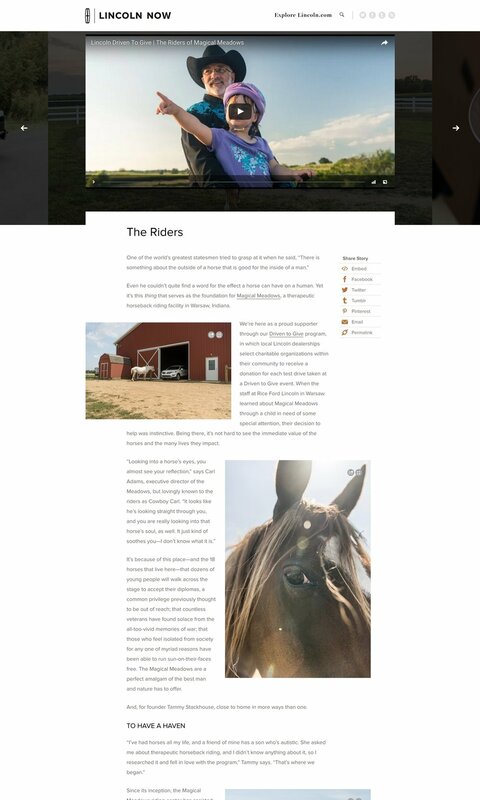 We published this content on Lincoln Now, the brand content hub for the client, on the program website, and across social channels to targeted audiences. Only the film portion of our story went onto the program hub, which was then dedicated to showing community participants how to find a program near them, and showing dealers how to sign up for a charity event of their own. The following article appeared on the brand content hub in its entirety. Most social posts about the story led to this content as an initial intro, through which audiences were directed into the Driven to Give program hub (right).